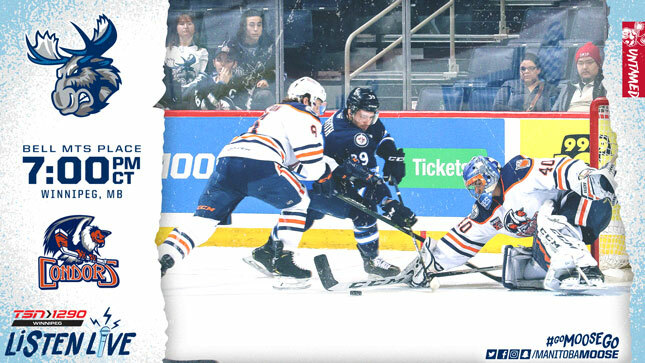 The Manitoba Moose (35-28-5-2) face off against the Bakersfield Condors (39-19-3-2) tonight at Bell MTS Place, to finish off their season series. The game begins at 7 p.m. CT and tickets are still available at moosehockey.com/tickets. The Moose jumped back into fourth place in the Central Division with a 3-1 victory over Bakersfield last night. The final two playoff spots in the division are still both up for grabs with third-place Iowa only four points ahead of seventh-place Rockford. Mikhail Berdin, making his fifth straight start, stopped 40 of 41 shots for the 10th win of his rookie season. Despite the increased workload, the native of Ufa, Russia has a 0.932 save percentage over those five starts games with 151 saves on 162 shots. That number matches his overall season save percentage in 19 total appearances. All three Moose goals in last night’s game came on the power play with Seth Griffith, Logan Shaw, and Mason Appleton all cashing in. In the last two games, Manitoba’s man advantage has scored on four of their 10 opportunities. Head Coach Pascal Vincent broke down how those two factors proved to be a winning recipe on Tuesday. Manitoba’s penalty kill is humming along at 96.2 per cent over the last 12 games. In game one with the Condors, the group shut down seven Bakersfield power plays including two separate five-on-three situations. Forward Felix Girard, who was named the game’s second star for his penalty killing efforts, said the club needs to keep things simple if they’re going to get another win over the Pacific’s top team. Tonight’s game will be broadcast on TSN 1290, moosehockey.com/listenlive/, the Moose App, and streamed live on AHLTV. Next up for the Moose, the Stockton Heat and a two-game series this weekend. Country Music Day (Apr. 6) and Fan Appreciation Day (Apr. 7) will wrap up Manitoba’s regular season home games. For tickets, head to moosehockey.com/tickets.